Here, a fancy meal becomes a no-brainer. 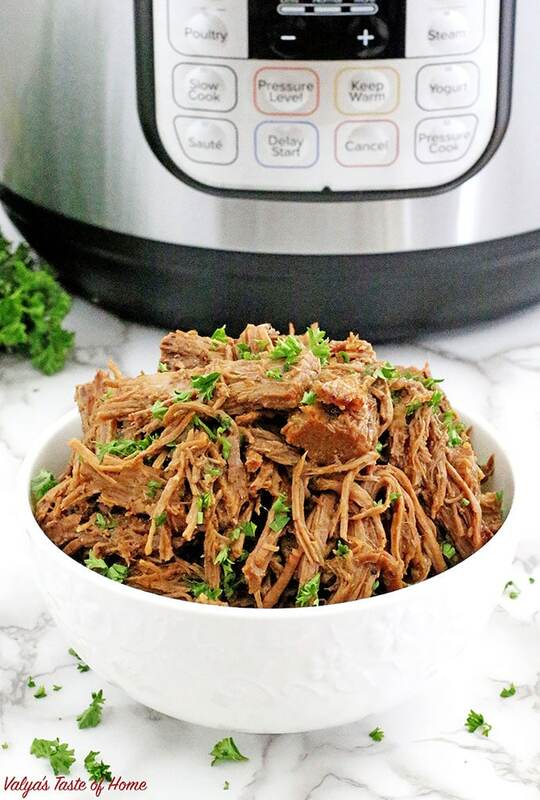 This Instant Pot Roast Beef Recipe is truly a gem and easy to make! It’s the same recipe that I like to make in the slow cooker, which cooks for five hours. Already a time saver from the traditional toilsome oven version, this variation saves you oodles more time by being dinner-ready within one hour in the incredible Instant Pot. You guys, it is super handy, and quick. Especially when you’ve had a tough day and want to finish it off with a satisfying meal. You can have a delicious, comforting dinner in no time. All you really have to worry about is the side dish: potatoes, rice or pasta to go with the roast while the beef roast is cooking. to sear the meat in the Instant Pot as a first thing, to speed up the cooking time. It also gives the roast a beautiful golden-brown sear look. Make this for your dinner today and receive rounds of thanks from your family, who may also be dragging their tired feet in the door from the cold. Don’t forget a good, healthy salad of your choice and try to fit in these delicious garlic bread as well, for a dinner that will taste as it dropped from heaven. Enjoy! 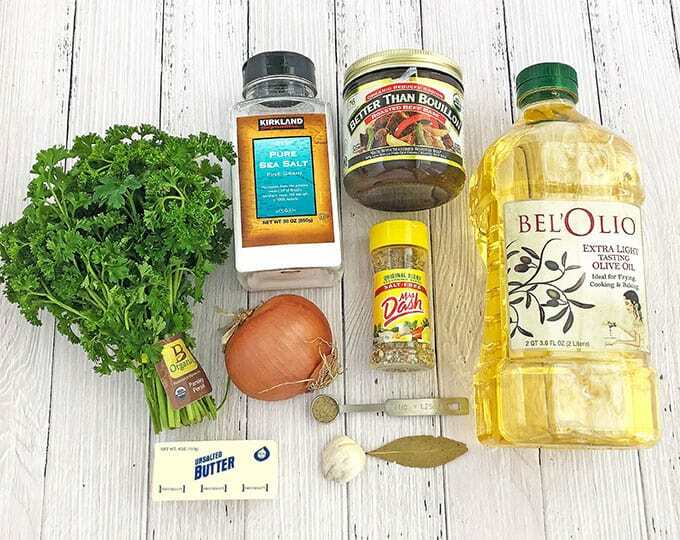 You may use 1 cup of beef broth instead of a cup of water and tablespoon of beef bouillon. You can use roast meat of your choice. First of all, before starting a recipe that involves meat I prefer soaking and rinsing the meat. If you purchased it from the grocery store especially most likely it was coated with red dye. Cut 3 lbs. beef chunk into 2 or more pieces. Soak the meat, change the water multiple times for about 30 minutes (you can skip this option if you prefer not to rinse meat). While the meat is soaking, cut onion and garlic into very small pieces. Prepare and measure out the rest of the ingredients. 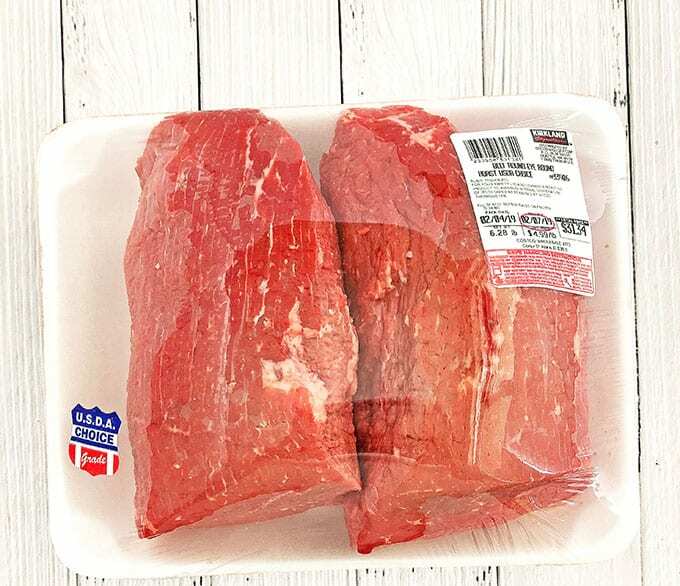 Rinse and pat dry with paper towel 2 chunks of beef roast meat. Turn Instant Pot on the “Sauté” cycle. Heat the inner pot for 30 seconds, add 2 tbsp. olive oil, place meat, brown first side for about 4 minutes and the other side for 2 minutes. Use a splatter screen to prevent as much splatter as possible. Remove the meat from the Instant Pot onto a platter. Into the inner pot of the Instant Pot add butter and garlic. Sauté for 15 seconds, then add chopped onions, continieu sauté everything for a minute stirring constantly. 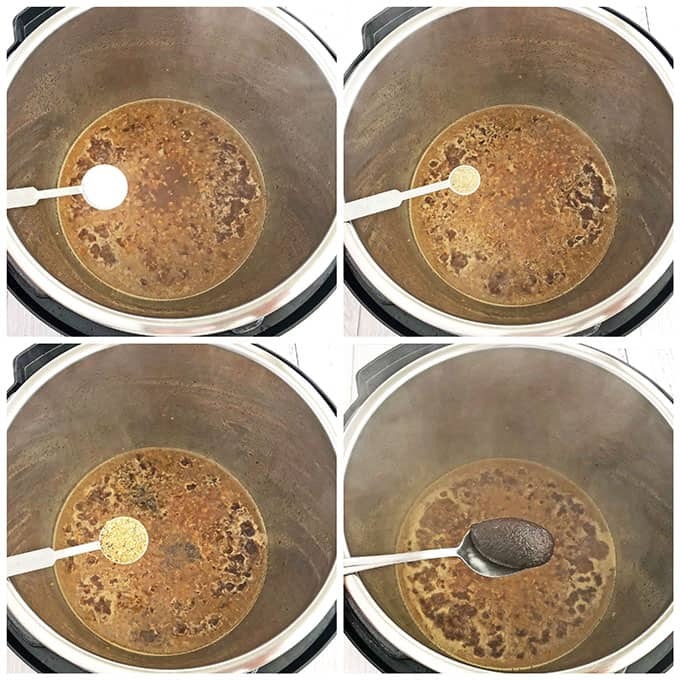 Add a cup of cold water and bring it to a boil stirring constantly to remove the burned stains on the bottom of the pot. Next, turn the sauté cycle off adn add dry ingredients: salt, pepper, Mrs. Dash Seasoning, and beef bouillon. 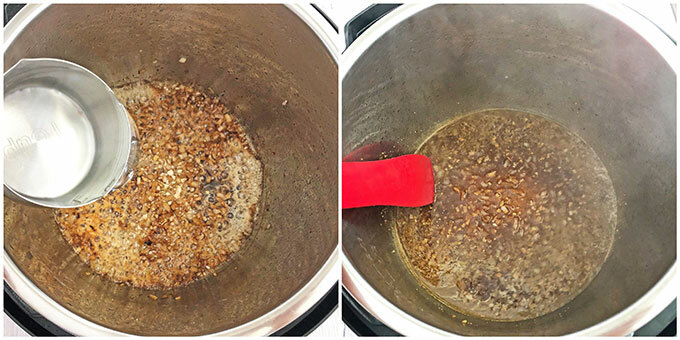 Finally, place seared roast chunks back into Instant Pot, add bay leave, cover the Instant Pot with a lid, turns the valve to sealing, press “Pressure Cook” and set cooking time for 55 – 65 minutes. After the roast is done cooking, turn the valve to venting to release pressure. Press the “Sauté” cycle again and sauté the meat while shredding the meat into pieces. Turn the “Sauté” cycle off and set “Keep Warm” cycle if not serving right away. 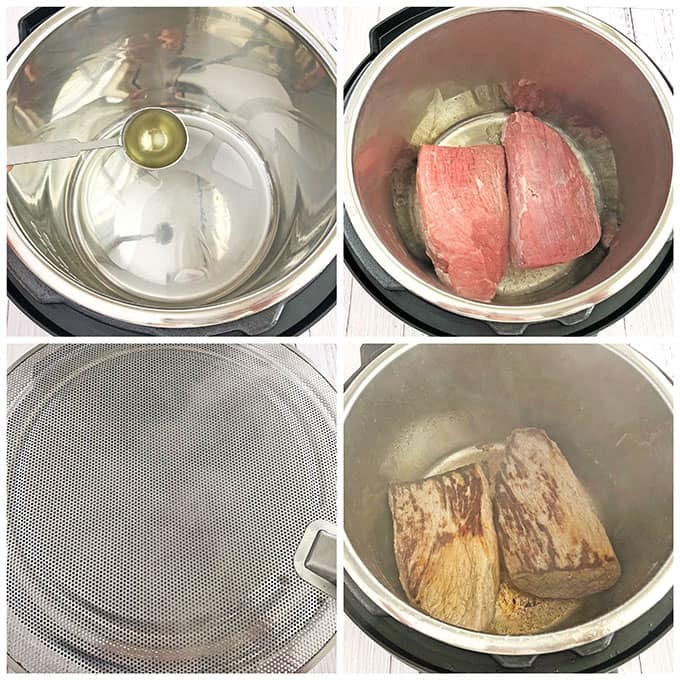 If you make this Easy Instant Pot Roast Beef Recipe, please share a picture with me on Facebook, Instagram or Pinterest. Tag with #valyastasteofhome. I’d love to see your creations! ???? Super delicious Beef Roast goes perfectly with mashed potatoes. Here, a fancy meal becomes a no-brainer. 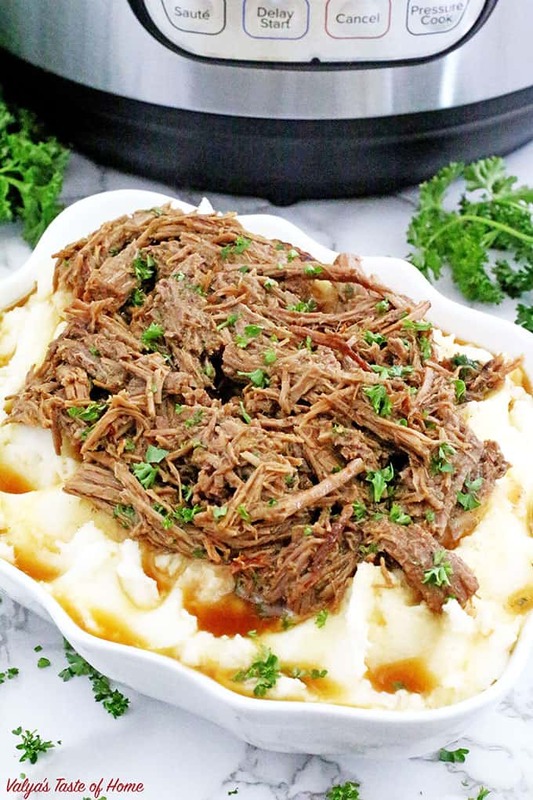 This Instant Pot Roast Beef Recipe is truly a gem and easy to make! It’s the same recipe that I like to make in the slow cooker, which cooks for five hours. Already a time saver from the traditional toilsome oven version, this variation saves you oodles more time by being dinner-ready within one hour in the incredible Instant Pot. It is super handy, and quick. Especially when you’ve had a tough day and want to finish it off with a satisfying meal. You can have a delicious, comforting dinner in no time. First of all, before starting a recipe that involves meat I prefer soaking and rinsing meat. If you purchased it from the store most likely it was coated with red dye. Cut 3 lbs. beef chunk into 2 or more pieces. Soak the meat change the water multiple times for about 30 minutes (you can skip this option if you prefer not to rinse meat). While the meat is soaking cut onion and garlic into very small pieces. Prepare and measure out the rest of the ingredients. Rinse and pat dry with paper towel 2 chunks of beef roast meat. Turn Instant Pot on “Sauté” cycle. Heat the inner pot for 30 seconds, add 2 tbsp. olive oil, place meat and brown first side for about 4 minutes and the other side for 2 minutes. Use a splatter screen to prevent as much splatter as possible. Remove the meat from the Instant Pot onto a platter. Into the inner pot of the Instant Pot add butter and garlic. Sauté for 15 seconds, then add chopped onions, continue to sauté everything for a minute stirring constantly. Next, turn the “Sauté” cycle off and add dry ingredients: salt, pepper, Mrs. Dash Seasoning, and beef bouillon. After the roast is done cooking, turn the valve to venting to release pressure. Press the “Sauté” cycle again and sauté the meat while shredding the meat into pieces. Turn the sauté cycle off and set keep warm cycle if not serving right away. 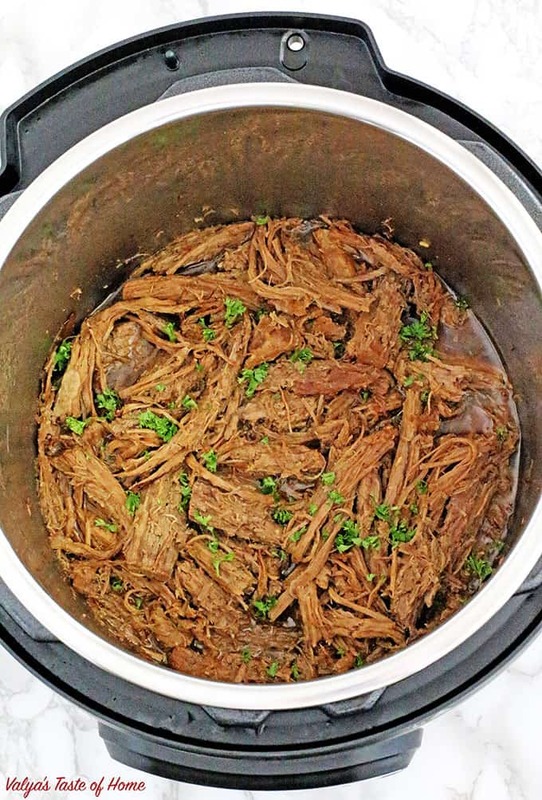 Love this Easy Instant Pot Roast Beef Recipe? Save and Pin on Pinterest! Thank you! Let me know how it turns out for you.